Note: A version of this post was originally posted in February 2017. In early 2017, I attended the AWP (American Writers and Writing Programs) conference in Washington, DC. 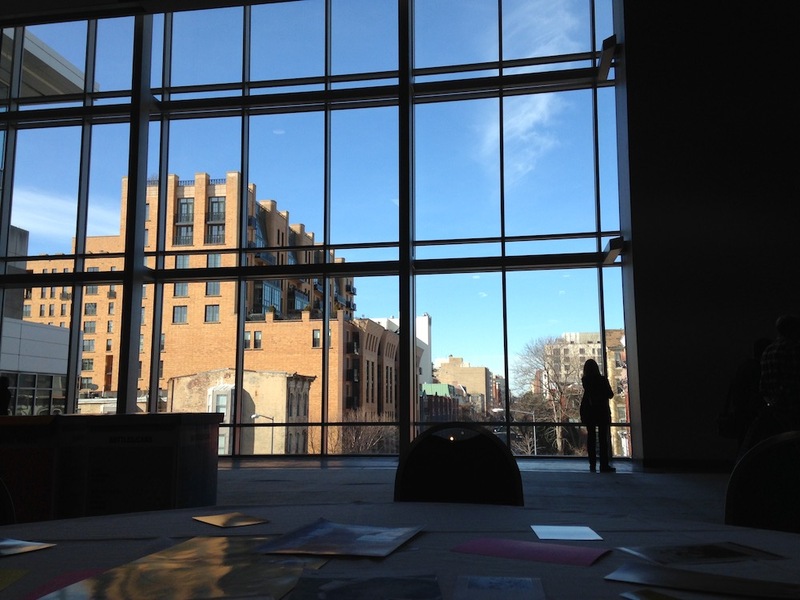 It was my first time at AWP, which was an overwhelming affair: six sessions each day with up to 35 choices, a monstrous book fair, evening meet-ups, and events throughout the city. The first day, I attended all six sessions, each of which included a panel of four or five experts. The morning sessions were filled with practical information about how to land an agent, what it’s like to have a book deal, what residencies are looking for in a writer, and how to give and receive feedback effectively. The afternoon sessions were less helpful: the panelists read essays they’d written or excerpts from their books, or told personal stories. This was less interesting to me, or maybe I was just exhausted from the day’s nonstop activity. While I gathered lots of information, I didn’t speak to a single person all day. The conference format, with only 15 minutes between sessions, made it hard. After each session, people would line up to speak to the panelists, who often included published authors, agents, editors at presses, and bookstore owners. While I would have welcomed an interaction, I didn’t have anything to pitch or a clear goal, so I didn’t join these lines. The next morning, on my commute into the city, I met a writer on the metro who’d spent all of her conference time so far navigating the book fair, pitching her book to presses she had selected ahead of time. This surprised me; I’d thought the presses were only there to sell books. I resolved to spend more time in the book fair that day. At first, it was hard: my natural aversion to talking to people, particularly people trying to sell me something, kicked in. Thankfully, I’d been tasked with bringing home pencils for my family, so I forced myself to talk to anyone who had pencils at the table. This led to some pleasant and interesting conversations. Note that these vendors were not organized into sections, and there were hundreds of them. I walked up and down each aisle looking at all of them, but had I had a goal, targeting specific vendors ahead of time would have made sense. 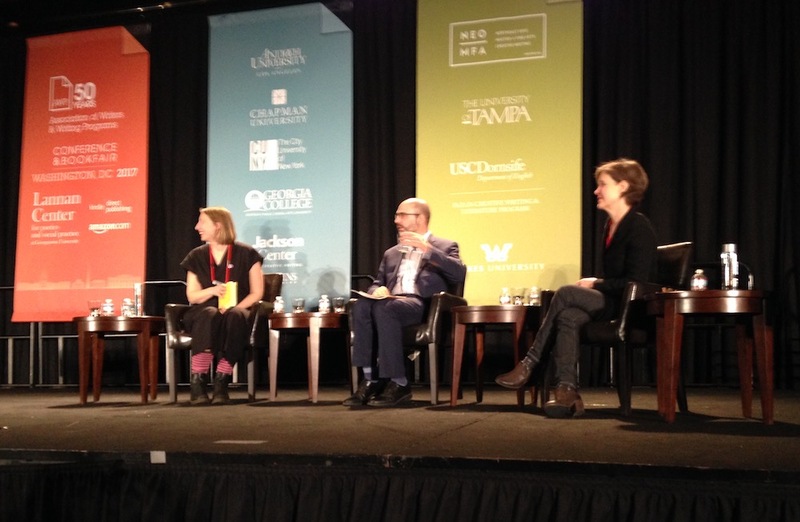 I also attended “a conversation with Emma Straub and Ann Patchett,” which was delightful. Both women are successful writers, and they talked about their lives, how they became writers, and which 2017 books they are looking forward to. The conference seemed very academic: some sessions had super-specific titles or focused on teaching writing, there was a definite trend toward writers attending formal programs, and the assumption seemed to be that we writers were all writing literary works. I had hoped to meet a romance novel publisher but didn’t see a single mention of romance! I also noticed a dearth of information about self-publishing. This struck me because I’d heard panelists (including successfully published authors) talk about the disappointments of book deals, the number of good books that don’t get published, the luck involved in successfully publishing, and the inability to live off of one’s writing royalties, even as a successful author. On the third day, I encountered outright hostility toward self-publishers in one panel, where a bookstore owner who won’t work with self-publishers made the assumption that people self-publish only because they’ve failed to publish traditionally. I was happy to find some booths in the book fair, such as the Authors Guild, that supported self-publishing. 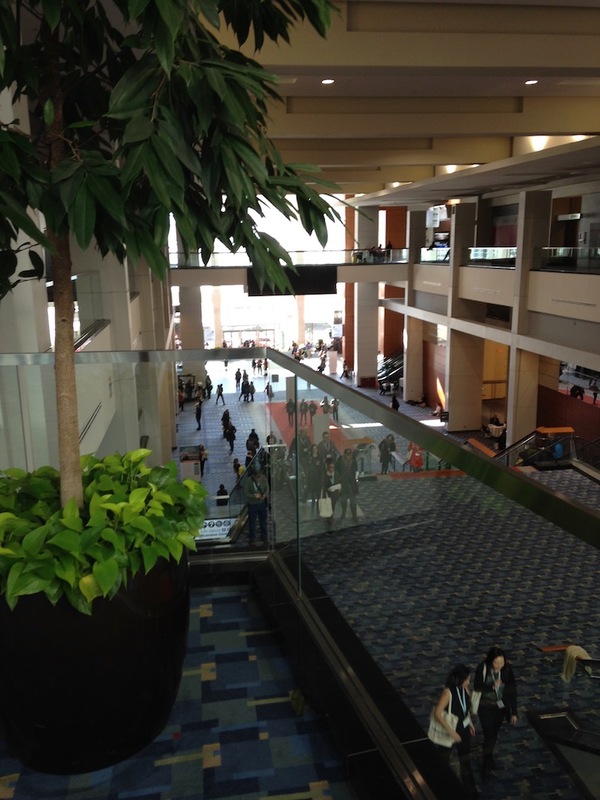 Attending the conference helped me see its possibilities, and I hope to go again. To get the most out of it, I will plan ahead: I’ll identify goals of attending and who I’d like to talk to. I might wait until I have a manuscript to pitch to presses, and then research the presses that are attending to find the ones that interest me. The book fair would be an invaluable resource if I were interested in attending a writing program or residency. Recognizing how overwhelming the conference is, I’ll choose which sessions and speakers interest me (subject to change), but not try to attend every session, using the breaks to peruse the book fair. I’ll make sure I plan time to network at vendor booths. I’ll also try to find somewhere to stay that doesn’t include a long, exhausting commute. This might help me attend some of the after-hours activities. And I will continue to hope that the AWP organizers will recognize the validity of self-publishing and begin providing resources to authors to help them self-publish effectively. This entry was posted in For Authors on January 18, 2018 by Emily.